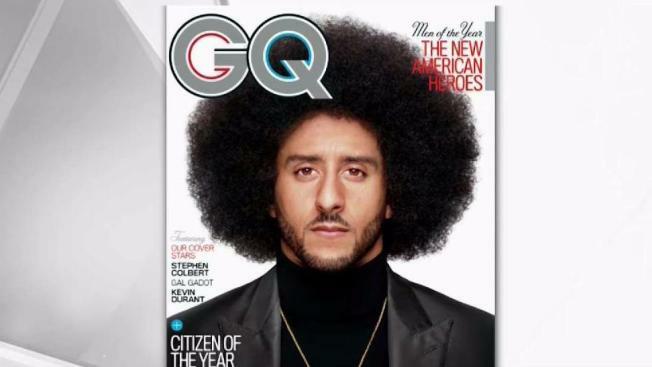 The men's magazine wrote that Kaepernick's kneeling in protest of racial inequality and police brutality "changed everything"
Former San Francisco 49ers quarterback Colin Kaepernick, who ignited a national movement last year after refusing to stand during the national anthem before NFL games, has been named GQ's "Citizen of the Year." The men's magazine wrote that Kaepernick's kneeling in protest of racial inequality and police brutality "changed everything." "It cost him his job," editors wrote. "It also transformed Colin Kaepernick into a lightning rod and a powerful symbol of activism and resistance." Kaepernick took to Twitter on Monday to announce that he was "honored" to be recognized by GQ. The former signal caller, who opted out of his contract with the 49ers after the 2016-17 season, has yet to sign with a new team. Last month, Kaepernick filed a grievance against the NFL claiming that he doesn't have a new home in the league due to owner collusion. Kaepernick may be out of the league, but his protest has not been forgotten. A number of players this season have continued to kneel, raise fists, sit or outright stay off the field during national anthems this year. Opponents, including President Donald Trump, believe Kaepernick and other players are disrespecting the nation and the flag by not standing for the anthem. 49ers defensive back Eric Reid, Kaepernick's former teammate, has reiterated that the purpose of the protest is to not disrespect the military, the flag or the anthem itself. "This is about systemic oppression that has been rampant in this country for decades on top of decades," Reid told NBC Sports Bay Area last month. "And I will continue to encourage people to educate themselves of how we got to where we are today, because it didn’t happen overnight. It’s not going to happen overnight to fix these issues, so we’re going to keep talking about it. I know I will keep doing what I feel is necessary to use the platform I have to make those changes."